MR11 bulbs High Power SMD LEDs(highest quality chip) produces a great light output. They are aesthetically and intelligently designed to significantly reduce energy consumption by up to 90% and deliver long life performance: with an incredible maintenance free 25000 hours of use. Each SMD bulb gives out a huge wide beam angle of light, and are designed to give the widest beam angle of any SMD bulb on the market. 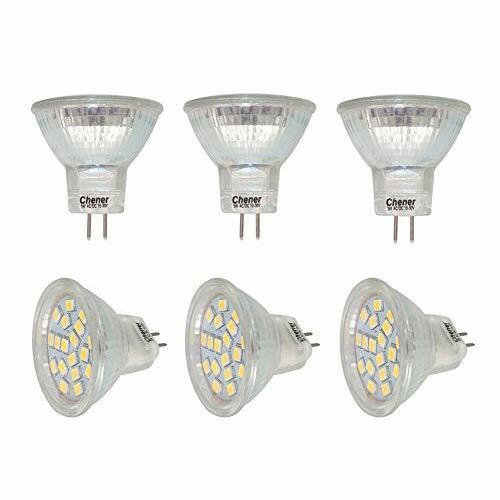 MR11 SMD energy saving LED bulbs are designed for domestic, commercial and retail lighting, and are a direct replacement for existing MR11 GU4 halogen bulbs. *Switch off the power before installing. *It is not suitable for use in totally enclosed fixture.LED device are very sensitive to temperature,heat will continue to accumulate if cooling bad,leading to higher junction temperature of LED,it will directly cause cut lifespan of LED and even failure. *Not dimmable, please don't use it with a dimmer switch. Don't use electronic transformers. LED bulbs work perfectly with iron core transformers.If you do not know about this please consult the electrician. If you have any questions about this product by Chener, contact us by completing and submitting the form below. If you are looking for a specif part number, please include it with your message.